Lack of talent and good looks fuel Eustace's demeanor that has been a wreck since his childhood. Throughout his life, he lived under the shadow of his mean spirited brother Horst, was hated by his mother (watch the clip below to see Eustace's tumultuous relationship with his mother); and neglected by his father. He is in constant denial over his lack of abilities and, as such, believes he can fix anything. Eustace is excruciatingly greedy, and will seize any opportunity to be paid. Courage's arrival was an unwelcome addition to his life, as it distracts his wife Muriel from feeding him; a fact that he emphasizes frequently. Despite this, Eustace has shown a genuine love towards Muriel and has on occasions allied with Courage to protect her. He is immune to emotions but has a soft spot for children that remind him of himself. His constant tormenting of Courage seems to be a guise to cover up his own cowardice, which is also quick to be displayed in a scary situation; in fact, he often displays even more cowardice than Courage himself. It's a possibility that Eustace is using defense mechanisms in order to cope with his difficult childhood. He may particularly be using the displacement mechanism, satisfying an impulse with a substitute object, hence why he has such an uneasy relationship with Courage. Eustace displaces his feelings of rejection and inferiority into Courage by constantly tormenting and scaring him, possibly to make himself seem dominant. 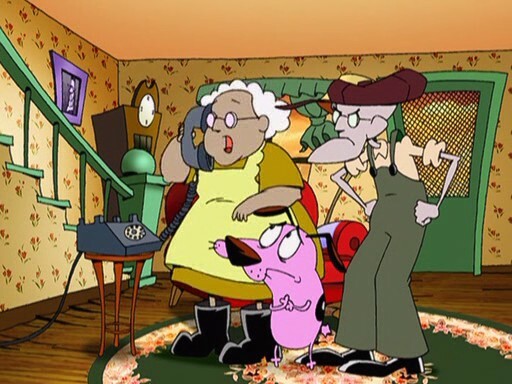 Courage is genuinely loved by Muriel, who is essentially his mother, which is something Eustace never got the chance to experience, hence constantly tormenting Courage. It is also evident that Eustace has Adler's Inferiority Complex. An inferiority complex is a lack of self-worth, a doubt and uncertainty, and feelings of not measuring up to standards. It is often subconscious, and is thought to drive afflicted individuals to overcompensate, resulting either in spectacular achievement or extreme asocial behavior. The latter is the case for Eustace who is extremely asocial; he is very inconsiderate and hostile toward Courage for not much rational reasons. The inferiority complex occurs when someone does better than you, criticizes you, shows authority over you, hurts you, or otherwise gains advantage over you. 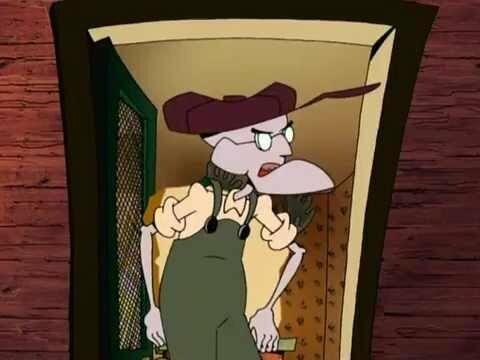 Eustace has the inferiority complex because he was always overshadowed by his over-achieving, affluent, and handsome brother (who clearly did better than him in life), was neglected by his father which hurt him, and was abhorred by his mother who constantly criticized him. A primary inferiority feeling is said to be rooted in the person's original experience of weakness, helplessness and dependency; which for Eustace stemmed from his miserable childhood in which he was forgotten and loathed. The inferiority complex is intensified by comparisons t romantic partners, adults, and siblings; and the latter is true for Eustace who throughout his life, was always compared to his successful brother, Horst. Baby Eustace, neglected, forgotten, and hated.